Cubeb, the tailed-pepper is an exceptional fertility aid for both the Kings and Queens out there, with its significant aphrodisiac properties. “It stimulates the parathyroid, and so it would be an excellent addition to menopausal formulas, helping with problems of osteoporosis”, says Jenny Rose in her Aromatherapy Book. 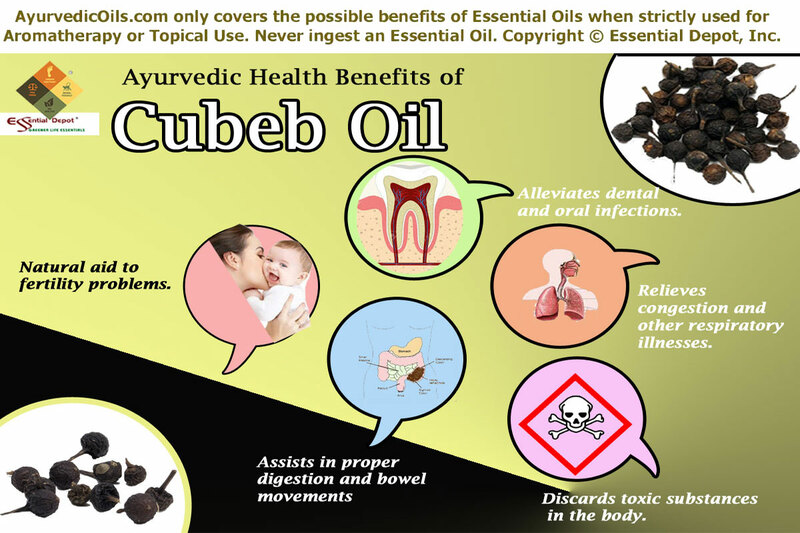 Cubeb essential oil is extracted from the dried Cubeb berries through steam distillation method. This plant is botanically called as Piper cubeba and is a limb of the pepper family Piperaceae. Cubeb was recommended by Charaka and Sushruta, the legendary Ayurvedic philosophers for treating halitosis, cough, loss of voice, fever, gonorrhea and certain other oral problems. Cubeb is known in Sanskrit as kankol and in Hindi as kabab chini and is a part of the Ayurvedic family Pippali kul. It is also used in Ayurvedic formulations for treating impotence, tastelessness, asthma, inflammation, piles, indigestion and menstrual problems. Native to the Java and Sumatra islands of Indonesia, Cubeb is often called as Java pepper and is also grown widely in India and Malaysia. It’s taste is often compared to allspice or pepper like. Cubeb is said to have reached the European subcontinent through the ancient trades by the Arabs through India and Arabians call it as Kababa and is also talked about in the writings of Alchemy. The use of Cubeb dates back to 4th century BC in various parts of the world. It was brought to China during the Tang dynasty and was called by the Sanskrit names vidanga and vilenga. The most interesting uses of Cubeb by the Tang physicians are to darken hair, treat demon vapors, loss of appetite and as a natural perfume for the body. Cubeb was also used in the Tibetan Medicine for treating problems associated with the spleen. Hildegard of Bingen prescribed the use of Cubeb as an antiseptic and as a good tonic for the nervous system. The London Dispensatorie written by Nicholas Culpeper in 1654 says “Cubebs were hot and dry in the third degree… (snip) they cleanse the head of flegm and strengthen the brain, they heat the stomach and provoke lust“. Theophrastus has stated the use of Cubeb as an important ingredient in making sweet-smelling confections along with cassia and cinnamon. The chemical constituents of Cubeb essential oil are sesquiterpenes (namely α- and β-cubebene, caryophyllene, germacrene, δ-cadinene and copaene) and monoterpenes (including carene, 50% sabinene and α-thujene) along with camphor, pinene, azulene, lineal, alcohol cubebol and other oxides like 1,4- and 1,8-cineole. The remedial attributes of Cubeb essential oil are carminative, diuretic, antiseptic, aphrodisiac, expectorant, antioxidant, antimicrobial, antipyretic, hepatoprotective, analgesic, disinfectant, astringent, gastro-protective and stimulant. Ayurveda implanted strong roots of health through prevention of illnesses, disciplined lifestyle and absolute balance with nature leading to aging in the pink and extended life-span even beyond a hundred years. This 5,000 years old ancient healing methodology strongly insists to be on par with nature for leading a hale and harmonious living. According to Ayurveda, everything on Earth is a combination of the 5 vital elements of nature and they are earth, fire, water, air and space. It says that the only difference between a living thing and a non-living thing is the element of space that rests within living organisms as the soul. Bones and muscles represent earth, fire stands for the metabolic processes and body temperature, blood is a symbol of water, air assists in breathing and space is the soul, which indicates that we are alive. Ayurvedic philosophy states that each human being is created with a unique individual constitution that comprises of three bio-energies known as doshas, namely vata, kapha and pitta types. Vata is a combination of air and space, pitta stands for fire and water and kapha represents water and earth. Ayurveda denotes that every individual has a predominance of any one these doshas and that determines their physical set up, mental makeup and their personality. Balance between these doshas is a symbol of good health and imbalances of these biological energies due to food and lifestyle changes causes illnesses. Treatments in Ayurveda vary from person to person even if it is for the same illness because this common sense science examines the individual constitution, patient history and the root cause of an illness before prescribing the suitable medication. The most prevalent Ayurvedic remedies are herbs, plant essential oils, Abhyanga (the art of Ayurvedic massaging), yoga, Ayurvedic routine, prayer, simple physical exercises and mediation depending upon the unique individual constitution for correcting the doshic imbalances. Cubeb oil is an effective Ayurvedic remedy for treating excess of kapha and vata energies and regularizing the pitta deficit. In Ayurvedic terms, Cubeb oil contains Ushan as its Virya means hotness as its main potency. Warmth and increased body temperature influence better intimacy in a sexual relationship. Excess of vata dosha can also be a reason for lack of sexual interest and impotency. 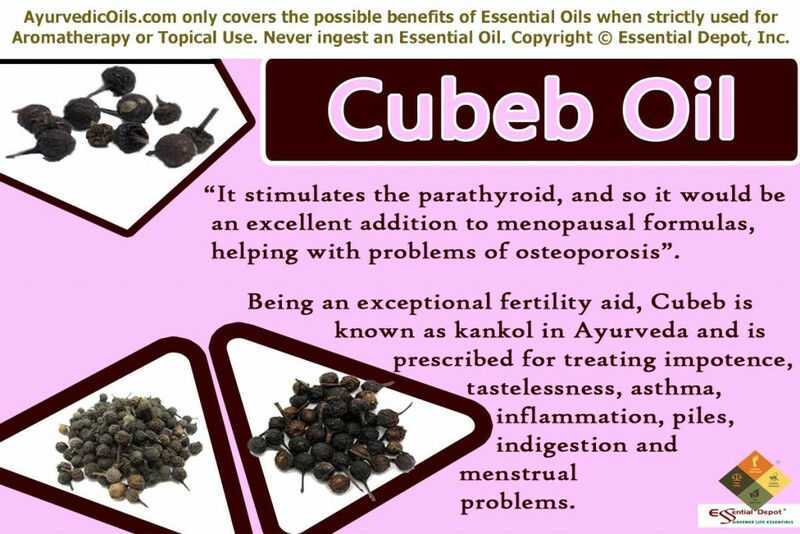 Cubeb essential oil is known for reducing increased vata dosha and helps treat various sexual problems. Unani medicinal system suggests the use of Cubeb corns for increased sexual contentment and is it because of this attribute Cubebs were initially called in Arabic language as ‘Habb-ul-Uruus. It has also been noted in the book ‘One Thousand and One Nights’ as a key ingredient in the preparation of an aphrodisiac cure for infertility. The essential oil of Cubeb has natural antiseptic, antimicrobial and astringent properties that assist in killing the harmful organisms in the mouth causing halitosis or bad breath, bleeding gums, plaque and cavities. Mix 1 drop of Cubeb oil in a cup of warm water and use it as a gargle for relieving all kinds of dental and oral infections. Vitiated kapha dosha is responsible for water retention, excess deposits of phlegm and mucous, thus leading to respiratory problems like nasal congestion, chest congestion, cold and other pulmonary infections including bronchitis. The ability to reduce increased kapha energy is the major reason for Cubeb oil being used as a promising remedy in treating respiratory illnesses. Adding 2 drops of Cubeb oil in warm bathing water or in an Ayurvedic massage blend with 2 drops of peppermint oil, 2 drops of Cubeb oil along with 5 ml sesame oil assists in excreting toxic substances in the body, thus treating urinary infections, obesity, inflammatory conditions and other genito-urinary problems. Just like Pepper, Cubeb also has hot, spicy and pungent flavor. It’s potent to increase pitta energy is of great value in dealing with digestive problems like tastelessness, loss of appetite, indigestion, constipation, flatulence, intestinal worms etc., where Pitta dosha represents fire and water and is in charge of the metabolic functions. Massage your abdomen with 2 drops of Cubeb oil mixed with 2 ml of coconut oil for effective relief from digestive disorders. A 2012 study on ‘In vitro efficacy of the essential oil of Piper cubeba L. (Piperaceae) against Schistosoma mansoni by Universidade de Franca published in Pubmed’ suggests that, “Piper cubeba essential oil possesses an effect against cercariae, schistosomula, and adult worms of the S. mansoni.” Schistosoma mansoni are adult worms that cause intestinal schistosomiasis (combined name for parasitic diseases). This article is meant only for the purpose of education and information. Using it as a substitute for prescribed medicines or professional medical advice is not recommended. Always use essential oils for topical application in a diluted form only as organic essential oils are highly concentrated liquids and can cause allergic reactions. Cubeb oil is a possible skin irritant and it is good to be avoided during pregnancy and nursing. Always consult your Ayurvedic expert before making the right choice of essential oils that suit your medical condition and unique individual constitution. This entry was posted in Essential Oils - Learn About and Purchase and tagged Aphrodisiac oils, Ayurvedic health benefits of Cubeb oil, Ayurvedic oils for asthma, Ayurvedic oils for bronchitis, Ayurvedic oils for impotence, Ayurvedic oils for nasal congestion, Ayurvedic oils for oral problems, Ayurvedic oils for respiratory infections, Ayurvedic oils for STDs, Ayurvedic oils for urinary infections, Ayurvedic remedies for digestive problems, Ayurvedic remedies for menopausal problems, Chemical constituents of Cubeb oil, Cubeb in Ayurveda, Health benefits of Cubeb essential oil, Natural remedies for bad breath, Natural remedies for sexual problems, Pipera cubeba, Therapeutic properties of Cubeb oil, Uses of Cubeb oil by AyurvedicOils. Bookmark the permalink.